I did it. I finally did it. 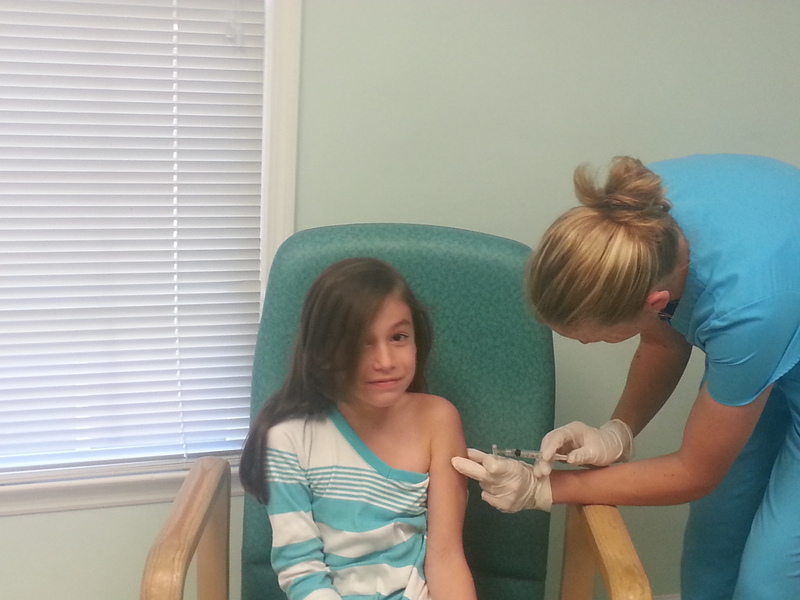 I got all my kids their flu shots last week, despite the many obstacles we encountered along the way. While it involved some anticipated anxiety, in the end, enduring humor conquered irrational fear. For the past few years, we’ve been able to walk into a nearby clinic without an appointment, get the FluMist and within 15 minutes walk out knowing that we were doing our part to help prevent the spread of the flu. Unfortunately, this year hasn’t been so easy. 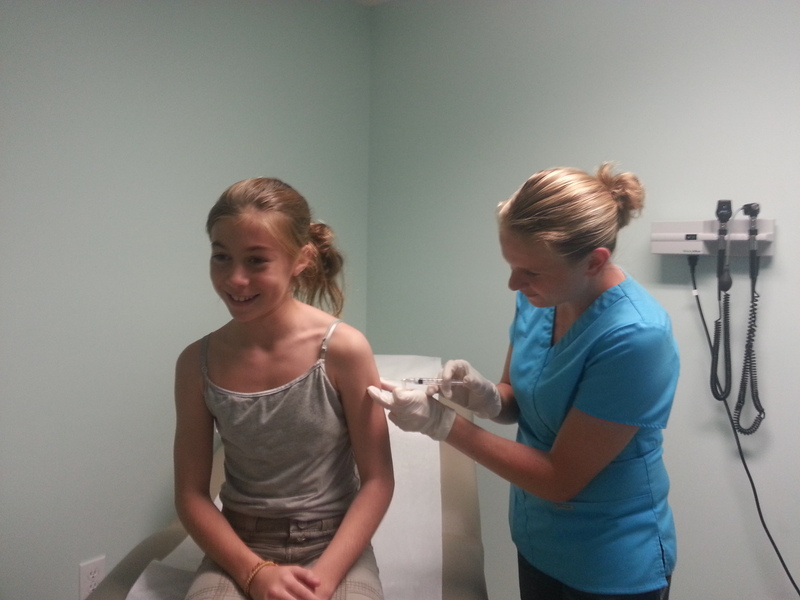 Having recently moved, I had to establish new care before a doctor would administer a flu shot for my kids. Since the earliest appointments I could make were over two months away, I spent September and most of October worried that my children would fall victim to influenza before having the chance to be vaccinated. (This actually happened the last time we moved, when my then 8-year-old daughter fell sick with the flu in September). At first I figured I could just take the kids to the local pharmacy for their shots. But then I learned that pharmacies in the state I live in can only vaccinate children over the age of fourteen. Since four of my five kids fall within that category, I was out of luck. But last week, our day at the doctor’s had finally come and I was relieved to know that my entire family would soon be vaccinated against the flu. 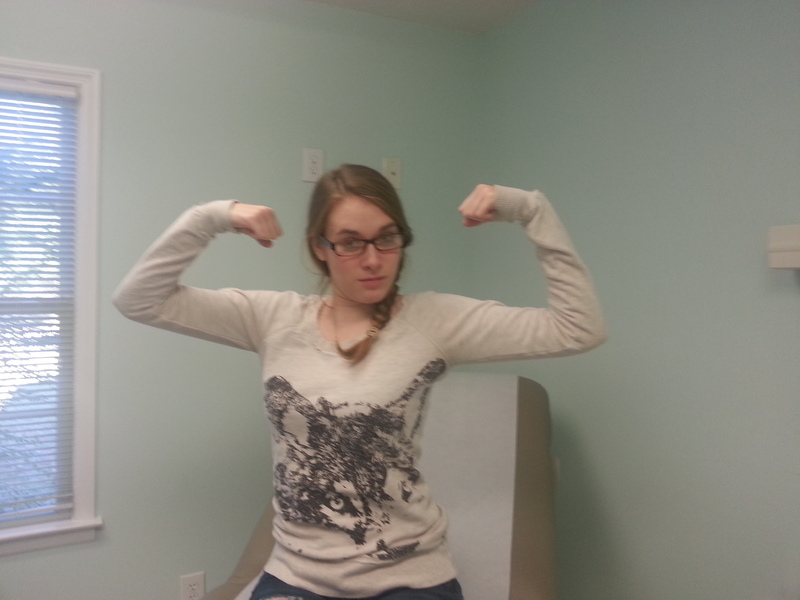 However, my 16-year-old was making her last-ditch attempt to convince me that she didn’t need her flu shot that day. She was even suggesting that we postpone until later in the season when her friend claimed there would be FluMist vaccine available, thereby avoiding the need for a shot in favor of a sniff. Of course, she knew it was hopeless, as I would never be persuaded by the suggestion that her 16-year-old friend was well-informed regarding the details of the vaccine supply in our area. But I have to give her credit for her creative persistence. While the comedy/drama ensued, my second oldest child sat there in silence, suffering with a stomach virus that came on suddenly the night prior. She is extremely afraid of needles and I’m fairly certain that she was secretly relieved that the timing of her illness would most likely result in the postponement of her flu shot. Looking back, it’s a good thing that her symptoms didn’t come on in the hours after her shot, for certainly that would have been reason for some seriously misguided individuals to believe that the flu shot can actually make you sick (while the informed person knows that the symptoms of the flu vary greatly from that of a stomach virus and that the flu shot can’t possibly give you the flu). Moments later we literally burst through the door at the doctor’s office. The truth is, it’s hard to sneak in under the radar when you arrive somewhere with five chatty girls. We quickly got acquainted with the staff, the nurse and ultimately the doctor and while there was lots of joking and laughing, I knew that just beneath the giggles my kids were also exhibiting a bit of nervous anxiety. Next up was my oldest daughter, and I suspect her sisters were surprised to see her hesitation as well. This is the little girl who was trampled by a horse at six years old and jumped right back in the saddle. This is the pre-teen who all but laughed when she busted her chin on the ice and had to get 15 stitches in her chin. This was the young lady who has endured more bumps, bruises, slide tackles and injuries through ten years of travel soccer than I care to remember. Yet, in this moment – in anticipation of the pain of this shot – she was obviously reluctant and fearful. One by one they each took their turn. And two days later, once my daughter had recovered from her stomach virus, she too received her flu shot without uttering a sound or shedding a single tear. It just goes to show that sometimes our fears are irrational. But we are stronger (and remain healthier) once these fears are overcome. “it’s just a pinch and then it’s over”. Thanks Christine…that’s a great link for flu.gov…just “tried” it, by keying in my zip code. Fortunately, I got my flu shot weeks ago…especially when you’re in the area affected by hurricane Sandy and most of my neighborhood has been without power since Sandy blew into town. A moving story about the flu shot for your children. Were you worried about your own flu shot or did it go with no problems? Liliady, I too am glad that I received my flu shot before Sandy bore down on my home town. I had enough on my plate to worry about between finding a way place for my four children to stay with hot water. If I had caught influenza- I can’t imagine the additional burden and stress that would have created. After the 19th of this month, my youngest will be 6 months old and with all that’s going on here, you bet she has an appointment for a flu shot. Everything and anything I can do to help decrease the odds of my children bearing additional strife and chaos will be done. John Fryer: I don’t think any of us who posted here were “worried” about our flu shots. 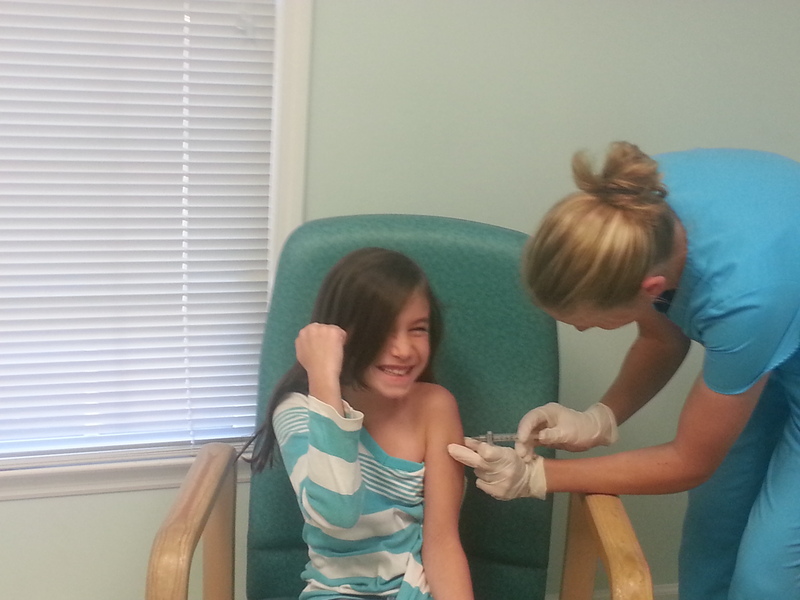 Melody and I were fortunate to have gotten our seasonal influenza vaccine shots before hurricane Sandy hit our area. @lilady – lots more worried about getting the flu. I have two small kids at home & the last thing any of us need is the flu this year!